The X1 system offers two basic interface options, the X1 Mini, with one USITT DMX-512 output (512 channels), and the X1, with four USITT DMX-512 outputs (2048 channels). Multiple interfaces can be attached to one X1 system for up to 16 physical outputs total. In addition, the X1 offers a direct or Ethernet connection to a number of third party software packages, like ArKaos VJ, which allows these products to be controlled without requiring a physical DMX output. The SMPTE timecode reader accepts 24 fps, 25 fps, 29,97 fps drop-frame (color) and 30 fps non-drop (black-and-white). Format detection is automatic. You can even play pre-programmed shows with a timecode format which is different from the one originally used for programming. 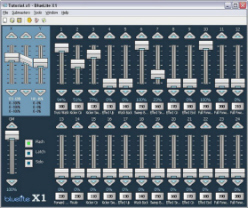 The X1 system offers four USITT DMX-512 outputs (2048 channels, [shown]), and the X1 Mini, provides one USITT DMX-512 output (512 channels). Multiple interfaces can be attached to one X1 system for up to 16 physical outputs total (4 when using X1-Mini's). In addition, the X1 offers a direct or Ethernet connection to a number of third party software packages, like ArKaos VJ, which allows these products to be controlled without requiring a physical DMX output. This is a standard USITT DMX-512 input. Users can select a 24 to 47 channel block from this input to control the X1's 24 Submasters, XY Crossfaders, Grand Master, Presets, and Event Lists. The block can be located anywhere in the 512 channel universe. This USITT DMX-512 output mimics whatever DMX-512 signal is present on the X1's DMX-512 Input. This is an active thru connection. In other words the X1's Thru connector has its own full-current RS-485 line driver, which is driven by the electrically decoded input signal. On the X1, you do not directly access DMX-512 channels. Instead, you create named Devices that use the X1's 2048 channels (4 universes) of DMX-512. Rather than having to memorize that Mac 2000 #7 uses channels 49 to 79 on universe 2, you create a Device that occupies those channels and name it 'Mac2000 7'. Devices are then referred to by name when editing Cues, etc. One advantage to this approach is that you can later move a Device to a different set of DMX-512 channels without losing any Cues you have already created for it. Devices have no channel limit. A Device can contain 1 to 512 channels. (A DMX-512 universe is limited to 512 channels by definition). On the X1, a Submaster is a fader (slider) on the Main or 'Console' window to which a Cue can be assigned. The X1 has 24 Submasters, which can be controlled using the mouse, keyboard, or an external DMX-512 console. Devices are created using Templates. Templates serve two very important purposes. First, Templates control how a Device looks in the X1 Cue Editor. For example, instead of remembering that channel 3 on a particular fixture must be set to 155 for green, you can pick 'Green' directly from a combo box. Second, Templates tell the X1 how the Device should respond to cross fading, Grand Master input, and so on. On complex fixtures, it is very common for multiple features to be combined on a single DMX-512 channel and/or for values on one channel to alter the behavior of others. This means that crossfades between settings on a conventional lighting board often yield unexpected results onstage from complex fixtures. Templates allow the X1 to fade from 'forward color spin' to 'reverse color chop' seamlessly, comparable to a fixture manufacturer's own dedicated, fixture-aware controller. On the X1, preprogrammed shows consist of a series of Events. An Event is a time (hours, minutes, seconds, frames [1/30th of a second]), a Cue number, a fade out time, a fade in time (if different) for the previous Cue, and an optional comment. 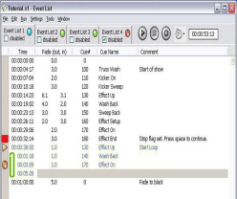 A collection of events is called an Event List and can be played back in several ways; in response to an internal clock, in response to external SMPTE timecode, or manually single stepping. The X1 has four available Event Lists and each can be played concurrently using its own XY Crossfader pair. This allows different aspects of a show (lasers, moving fixtures, conventional lights, and special effects) to be preprogrammed separately without having to be concerned about overlapping event times or cross fades. The X1 includes a built in Automation API which allows it to be easily extended and adapted. 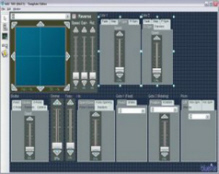 Samples include MIDI input, Windows Media synchronization, a show scheduler, and the powerful LivePanel (shown above), which includes 4 powerful chaser/sequencers and single keystroke recall of over 1,000 chases or cues. With the release of version 1.5a3, we've also added the iPanel app which allows you to control your Live Panel using your iOS or Android. On the X1, the term Preset has a very specific meaning. An X1 Preset is a collection of Cue assignments for all 24 of the X1's Submasters. Since the X1 has 24 presets, each of which can remap all 24 Submasters, operators have potentially very rapid access to 576 Cues for manually operated shows. Effects are available on any Device created from a Template which includes a Position Control. Every Position Control has its own build in effect generator. This means that every fixture can be set to its own shape, direction, speed, gain, and rotation. Effect shapes can be crossfaded. That is, an Arc will slowly morph into a Circle and so on. 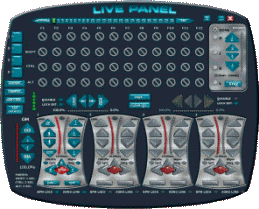 The LivePanel application is a sophisticated chaser designed to be used with the computer keyboard. It utilizes the BlueLite X1 Core, and stores over 1,000 chases/sequences into pages of 48 for single keystroke recall. 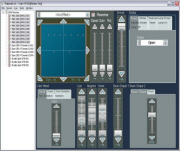 LivePanel features four independent chasers/sequencers with unlimited steps, and includes a random generator for dance floor and exhibit applications. LivePanel also uses crossfaders and built-in fading logic for smooth transitions in a single keystroke.